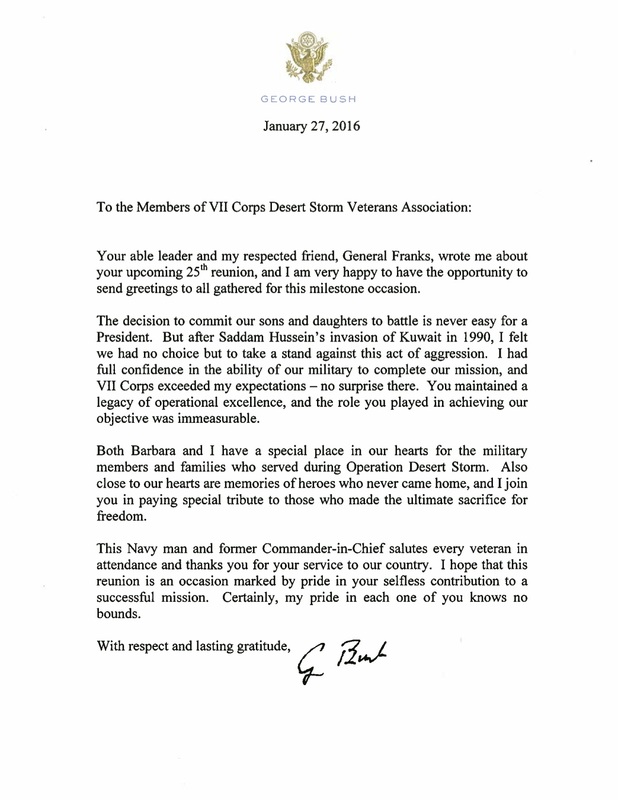 Please convey to the entire VII Corps Desert Storm Veterans Association my thanks for the very kind birthday wishes. Your warm sentiments mean a great deal to me. With respect and lasting gratitude for your service to our country. As we approach the sacred day of Memorial Day in America where we honor and remember our men and women who died in military service, Denise and I, on behalf of our newly elected Association President Mark Rado and our new VII Corps Desert Storm Veterans Association Board, are reaching out to you and your Families to thank you for your own service and your service in VII Corps during Desert Storm. To remember our own fallen this 25th Anniversary year of our victory in 1991, on 27 February at our VII Corps Reunion Chaplain Col (ret) Wayne Lehrer conducted a military Memorial Service, as he has done each year, where our past Association President MG (ret) John Altenburg read each of the 111 names of our VII Corps Desert Storm Soldiers who in Lincoln’s words, “gave that last full measure of devotion.” One of our former commanders, this year LTG Karen Dyson, gave commander remarks as is appropriate at these ceremonies. This year in special commemoration following our Memorial Service, CSM (ret) Harold Shrewsberry, Association Vice President and I, accompanied by former division and major unit commanders and CSM, laid a wreath at the Tomb of the Unknown in Arlington National Cemetery to honor and remember our 111 Fallen. We said at the end of Desert Storm 25 years ago that “we will never forget” and we have not forgotten our VII Corps comrades nor as a Nation all those who have fallen in military service. May we all pause in our own way this Memorial Day 2016 in deep remembrance to honor and remember those Soldiers who gave it all in military service–and their Families. We value our service with each of you and look forward to seeing many of you at our Reunion the weekend of 24-26 February 2017 in Houston, TX. (Picture Above) VII Corps DSVA new Board of Directors installed on 23 April 2016 in Springfield, VA at a called Board meeting. SPRINFIELD, VA: On Saturday 23 April 2016 the VII Corps Desert Storm Veterans Association installed new members to their Board of Directors at a called Board Meeting. New officers were voted on at the 27 February 2016 called general membership meeting in Arlington, VA.
New officers installed were: Colonel Mark Rado – President, Stan Lenox III – Vice President, CSM(R) Violet McNeirney – Secretary, CSM John McNeirney – Treasurer, MG(R) John Altenburg – Legal Counsel, COL (Chaplain) Wayne Lehrer – Chaplain, BG(R) Ed Dyer – Scholarship Committee Chair, CSM(R) Harold Shrewsberry – Golf Tournament Chair, COL(R) Art Hoptop – Historian. General Fred Franks, USA-Ret will continue to serve as Chairman of the Board. General Fred Franks, USA-Ret – Chairman of the Board of Directors thanked the outgoing Board members for their distinguished service and welcomed the new Board Members. Written statement will be forthcoming from the new President and Chairman of the Board of Directors. Your able leader and my respected friend, General Franks, wrote me about your upcoming 25th reunion, and I am very happy to have the opportunity to send greetings to all gathered for this milestone occasion. The decision to commit our sons and daughters to battle is never easy for a President. But after Saddam Hussein’s invasion of Kuwait in 1990, we had no choice but to take a stand against this act of aggression. I had full confidence in the ability of our military to complete our mission, and VII Corps exceeded my expectations -no surprise there. You maintained a legacy of operational excellence, and the role you played in achieving our objective was immeasurable. Both Barbara and I have a special place in our hearts for the military members and families who served during Operation Desert Storm. Also close to our hearts are memories of heroes who never came home, and I join you in paying special tribute to those who made the ultimate sacrifice for freedom. This Navy man and former Commander-in-Chief salutes every veteran in attendance and thanks you for your service to our country. I hope that this reunion is an occasion marked by pride in your selfless contribution to a successful mission. Certainly, my pride in each one of you knows no bounds. Sam Donaldson clip with CO D, 1/37 Armor 1st AD on 21 Feb 1991. VIDEO: ABC news clip that Sam Donaldson did with CO D, 1/37 Armor 1st AD on 21 Feb 1991. CO was then CPT Dana Pitard. Great testimonial to our Soldiers. Click the video above to watch an ABC news clip that Sam Donaldson did with CO D, 1/37 Armor 1st AD on 21 Feb 1991. CO was then CPT Dana Pitard. Great testimonial to our Soldiers. It is with great sadness that Denise and I learned of MG(R) John Landry’s passing this morning. John served a long and distinguished career in armored cavalry with an exemplary combat record in Vietnam. He was our superb VII Corps Chief of Staff, handling and coordinating the relentless details of putting together a 146,000 Soldier Corps, then the planning and execution details of our 89 hour 250 km attack from the Corps Main CP. He and wife Margie were faithful attendees at our VII Corps DSVA Reunions and Memorial Services. We shall all miss him, and on behalf of our VII Corps DSVA Board and Association; Denise and I extend our deepest sympathies to his wife, Margie, and Sons Scott and Sean and their Families.